It was another beautiful day on Sunday. 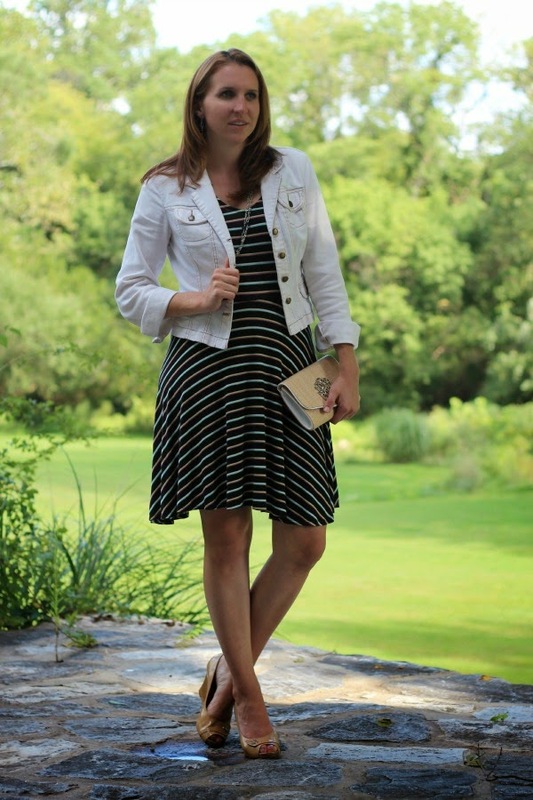 I wore this casual striped cotton dress with my white jean jacket, neutral wedges, and straw clutch. This dress is super comfy, so it was perfect for an easy Sunday spent brunching and relaxing with family! To me throwing on a dress and jean jacket is just as easy as wearing jeans and a tee. Plus it makes it easy to dip my feet in the pool! Linking up with The Pleated Poppy, Shopping My Closet, Because Shanna Said So,Tucker Up, Thrifting Diva & Two Stylish Kays, The Mummy Chronicles, Transatlantic Blonde, Style Elixir, and Glossy Blonde. 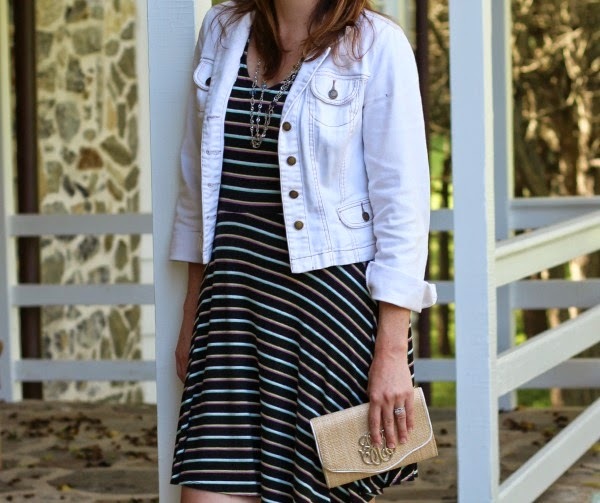 Love how you styled the dress with the white jean jacket and neutral accessories! Your monogram clutch is super cute! Love this whole outfit! I love almost everything from American Rag! They are definitely one of my favorites! Your dress is stunning. 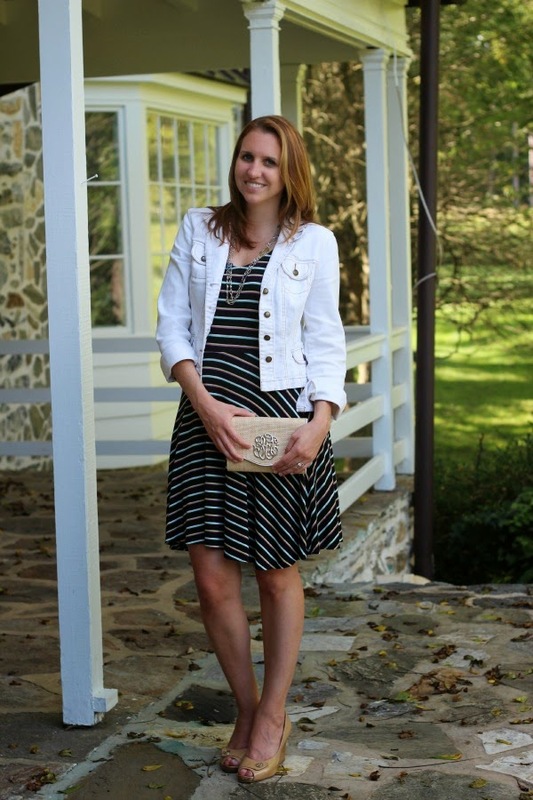 I love the stripes and your clutch is gorgeous! You know why -- I am still on the hunt for the perfect white denim jacket such as yours. You did a great job with styling the stripes and the denim jacket. I love it!!! 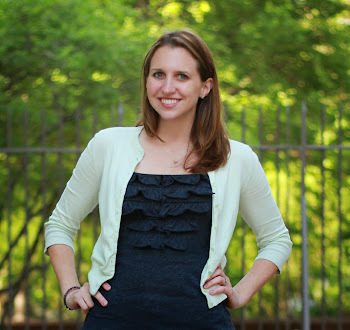 Thank you so very much for linking up with the Thrifting Sisters. We truly appreciate you linking up.